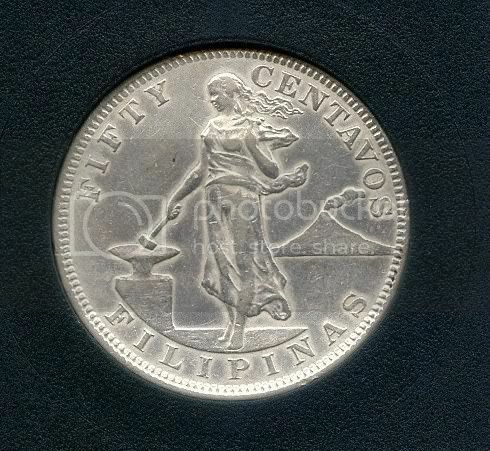 The 1903 San Francisco Mint fifty centavos is perhaps the most expensive United States-Philippines coin ever sold, catalog at $22, 000. Only 2 specimen have reported and only one formally auctioned for the price mentioned. 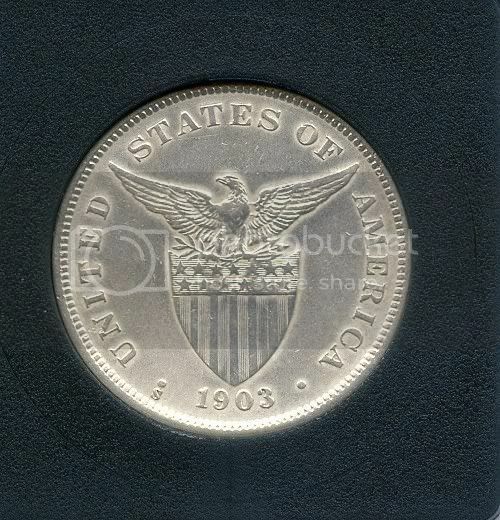 Do not mistake this one for the common 1903 Philadelphia Mint fifty centavos. This coin is an absolute rarity. The story of how this coin surfaced is still a mystery but there is however rumors in the Philippine Numismatic And Antiquarian Society and even the former owner spreading how this coin made history and has changed the life of a neophyte coin seller. The story goes like this according to its former owner; It was again another ordinary day for this shop owner when he acquired a few coins for his shop. Despite of being a coin and antique dealer, he is well known in the organization as trader of gold and silver because of his lack of interest in looking into coin catalog prices. Then one day, a new comer came to his shop. He browsed the glass shelves to look for coins. As usual, the dealer underestimated the newcomer since he considered himself as one of the veteran in the industry. He usually sees this person in the auction but he paid no attention since just like every other newcomer, he saw him not as competition to his business. The young man pointed his finger and asked for the price of a particular coin on display. The dealer responded with sarcasm and told him that the coin is his for 10 pesos. Without further hesitation, he pulled the amount from his wallet and then off he went when the dealer handed over this coin. The dealer still remembers that it was a fifty centavos coin dated 1903 which for him were like the numerous 1903 fifty centavo coin in his shop in the past years. Later did he realized that he just sold one of the most expensive Philippine coins in history for just 10 Pesos.